(ROMWE is one of my favorite online shops. As everyone spends the long weekend out of town with family or friends, I stay home blogging and accomplishing everything there is written down on my to-do list. I've only got a few days left before I head back to my dear hometown, Davao. Can't wait to be reunited with family and friends! Enough about that. Lets get down to business and talk about the outfit. Well this is something I wore for STACHE, a virtual magazine. The issue is posted at the end of this blog post (turn to page 62). I arrived a bit late for the shoot even if I was rushing to the location after my class. It's just so hard juggle time when you're studying especially in this city where everything is an hour or so away! The sun set as we finished with the make-up so we had to scout for a place with good lighting. What better place could provide this than a 24/7 convenience store such as Ministop? So yeah. As crazy as it may seem, i stood, smiled, pouted, modeled and posed inside. Everyone was looking but I didn't mind. It was worth the shame. Great thing I had Elisa and Thea with me to at least make it a lil less embarrassing. haha! Everything seemed loud and psychedelic in this ensemble. 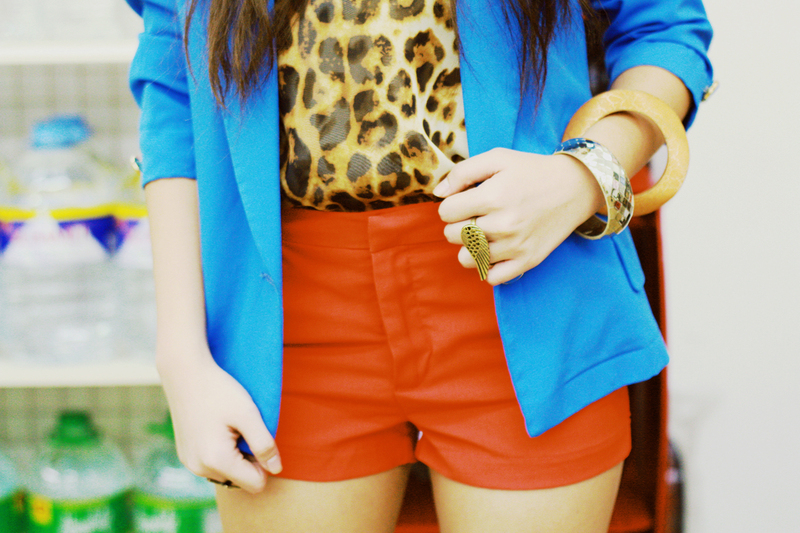 The electric blue & orange gave a mind-altering feel to the outfit, plus the leopard top and shoes! I opted for a look that differs from my usual warm-colored/dull ones. I wanted something bold and bright and voila! This combo came across my mind. Thanks to my yaya who saw and suggested the blue jacket! Great look! you know how to mix two leopard print! Amazing! You look gorgeous, I love this colors together! You're hair is just gorgeous. I love it! Of course I like it!!!! Is that really a question? Oh god you are STUNNING! Amazing look, love love love! Amazing pics ! Love the leopard touch ! You look fantastic ! I'm just stumbled across your blog. You have amazing personal style! Gorgeous look! I love just everything about that! I love your look ! Those orange shorts are to die for ! Ths many colours combination is great ! Congratulations on your feature ! you look gorgeous! your blog is lovely! your colour blocking is just perfect! VOTE FOR MY LOOK & WIN!